Today is challenge #4 at Pollycraft Challenge Blog!!! Can you believe that.... #4!! I have to say, I have really enjoyed coloring these images! Loads of fun...and speaking of fun. Is he not the cutest lil thing you've seen? He reminds a lot of my little dumpling Buddy!! I tried to do something a little different with the hair again and I am partial to what I think of it as this point. Isn't that just the cutest card?! And colored so well!!! Great job! Oh my! He IS the cutest! 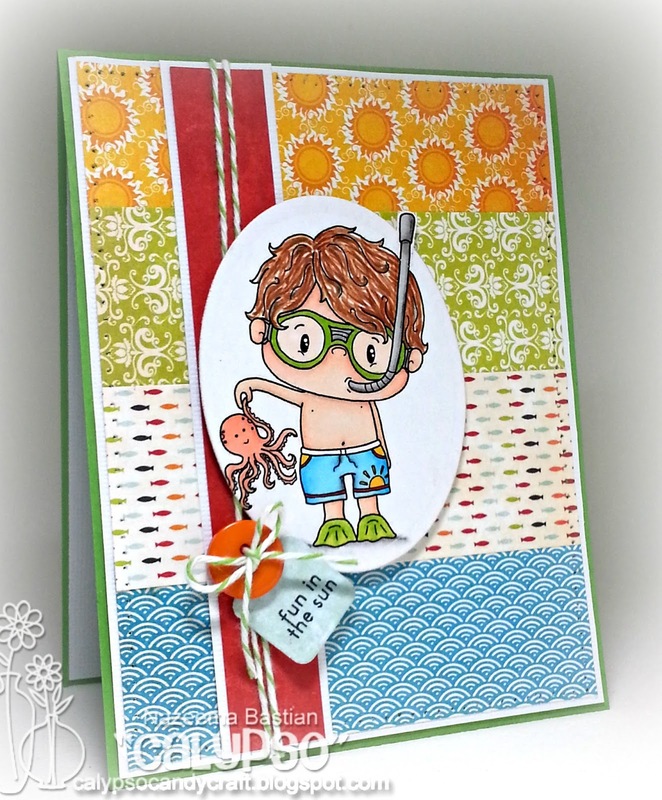 Love his little octopus friend too and all those fun, bright, summer colors! Too cute! He certainly is adorable! Love all the DP you have used for the background. LOVE, LOVE, LOVE this card! :):) Thanks for playing along with us at JIC!